Pelvic girdle pain (PGP) occurs in an estimated seventy per cent of women during pregnancy and ranges from mild symptoms to severe disability. It is difficult to manage and can interfere with an individual's ability to move, undertake daily functions and sleep. Many of those affected need to take sick leave and there are increased health risks, with higher rates of labour induction and elective caesarean to relieve the pain. PGP is thought to occur due to increased pelvic joint motion and supports (orthoses) such as pelvic belts are commonly prescribed. More recently DEFOs (dynamic elastomeric fabric orthoses) have been developed to address this problem. No studies yet have evaluated the comparative effectiveness of these two interventions. ESF (European Social Fund) Convergence investment via the Combined Universities in Cornwall Research Project has allowed DM Orthotics to work with the research team within the Faculty of Health and Human Sciences at University of Plymouth to appoint PhD researcher Lee Cameron. His aim is to investigate the effectiveness of DEFOs which are aimed at reducing PGP in pregnancy. It is hoped the study will mean that Redruth-based DM Orthotics and similar businesses can produce a scientifically and clinically evidence based product - increasing sales, market presence and employment. It will also help to raise the research profile of Royal Cornwall Hospital, leading to further collaborations, and could potentially benefit the local Cornish pregnant population by reducing pain during pregnancy. DM Orthotics Ltd works in research and development to produce state-of-the-art DEFOs and has recently developed one for PGP management in athletes, with evidence of the effectiveness of these in reducing pain. 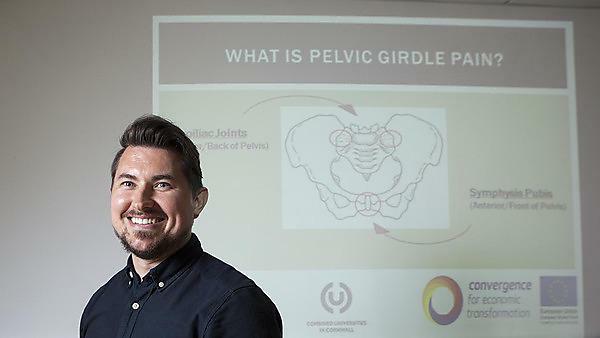 Lee runs a weekly research clinic at the Royal Cornwall Hospital in Truro where he is carrying out a trial to investigate the comparative effectiveness of a pelvic girdle belt (the standard NHS intervention) with DM Orthotics DEFO. Evaluating how effective these two orthoses are with regard to improving pelvic girdle pain, function and quality of life through self-report postal questionnaires. Cornwall and the Isles of Scilly is the only area in England that uses ESF as a direct investment in Higher Education and research.